A one-eyed man who presently bears the title of the Knight of One, the strongest amongst the Rounds. He pilots the Knightmare Frame Galahad. Despite his status and combat abilities, he believes that war should be used as a last resort, and also sees strength without restraint as needless violence. During the second battle of Tokyo, Bismarck leads the Britannian forces guarding the shore against Li Xingke's invasion force. Li and Bismarck battle, with Li unable to defeat him. Bismarck compliments Li's skill when he purposefully takes a hit to move into position to rescue the Chinese command vessel. 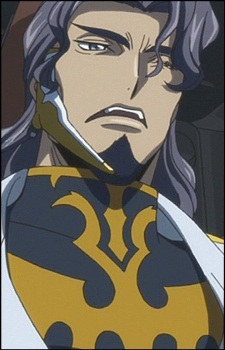 During Schneizel's attempted coup d'état of Emperor Charles, he intervenes to stop Suzaku's assassination attempt on the Emperor. Suzaku's "live" command urges him to flee, indicating that Waldstein is extremely dangerous. Following the death of the Emperor and Lelouch's ascension to the throne, Bismarck leads three of the remaining Rounds' members and a squadron of Knightmares in an attempt to remove Lelouch from power, but they are decimated by Suzaku in the Lancelot Albion. Bismarck attempts to use his Geass, which allows him to see a few seconds into the future, to even the odds, claiming that the only person he ever had to use it on was Marianne. Suzaku's "live" command allows him to achieve victory despite Bismarck's Geass, slicing the Galahad in half. Bismarck dies gasping Marianne's name.